Russia 2018 – VAR, waistcoats and a great lesson in coaching. For five exciting weeks in Summer 2018, Russia played host to the 21st FIFA World Cup, featuring the national football teams from 32 global nations competing for the coveted trophy and glory of winning. Russia 2018 was the first ever to be held in Eastern Europe, and costing an estimated $13.2 billion, bears the label of being the costliest World Cup so far! The tournament promised a feast of football with 64 matches, played in 12 venues, located in 11 cities and attended by a predicted 570,000 foreign fans and 700,000 Russians over 31 days – and it certainly delivered on many levels. France were crowned the champions of the world, but there were other winners too! This was the first time that VAR (Video Assistant Referee) was deployed at a major football tournament and although the technology may have divided opinions, it ultimately didn’t bring a hiatus to games as had previously been feared. Russia 2018 generated another first, when England beat Columbia on penalties in their last sixteen encounter. No England team had ever won in a World Cup match when it came down to penalties – despite many brave attempts. The team finally turned their fortunes around and really started to believe in their ability. More importantly, they brought the country along with them as England reached their first World Cup semi-final in 28 years. So, What Made the Difference for England in 2018? The answer from pundits and public alike is that the success was down to the management style and approach of their head coach Gareth Southgate. He has been credited with giving his young team the strength of character to “write their own stories”. Southgate has demonstrated key attributes of effective coaching which are equally transferable to sales leaders in the business world. Strong leaders, in business and sport, have the expertise and knowledge of their field to develop strategies that help successfully navigate their team through the many challenges. They have the confidence to assign valuable resources in the right places and encourage their team to make wiser decisions and plan better to achieve potential. This includes learning from mistakes to build for the future. Gareth Southgate has earned his caps on the football pitch, having played for England 57 times. His time as a player gave him insight into the workings of the Football Association (FA), and a stint as manager in the professional arena provided additional lessons and experience when he was appointed manager of England’s under-21s in 2013. Southgate was instrumental in an ambitious initiative by the FA to coach players of all ages on a set of shared principles, so that younger players were able to step up to the mark and play at the senior level when called upon. For this World Cup, England had the least experienced squad since 2000, but many of the team had played in the Under 21 team, under Southgate’s guidance. Also, by avoiding the more well-known, experienced players it also meant that the media focus of the team centred on their training and playing, rather than their behaviour, or that of their families, off the pitch. It was a wise decision which kept the players and staff focused as was evident in their behaviour both on and off the pitch in Russia. For coaching to really work, leaders must earn the trust of their team. Their experience out in the field plays a huge part in building that trust. They have been in the team members’ shoes and can give them the advice and guidance they need to succeed. On top of that, they must prioritise building a safe and comfortable environment for team members to grow. Gareth Southgate has fostered a culture of shared respect in the England team and encouraged them to “create their own history.” Through one-to-one sessions with the players discussing each of their roles and performances in depth he helped to align them to the game plan. Coaching many of the team at the Under 21 level was invaluable in getting to know the players and for them in turn to understand the mindset, strategy and team play needed to compete at senior level. As a manager Southgate has instilled a confidence and closeness which was evident during the tournament. Southgate took charge of the team but encouraged them to face the media in press briefings. They handled the interactions efficiently, displaying an obvious respect for each other and acknowledging the hard work and achievements of the whole team, including the backroom staff. It’s amazing what people can achieve when they feel confident. You can’t expect to lead your team successfully through changing buyer trends and business data if you’re unable to navigate through it yourself. Successful leaders keep a close eye on what is currently happening in the business, as well as using historical sales data to identify any trends taking shape. By keeping watch on the performance of their team and the health of the business, a sales leader can adopt the correct strategy and allocate resources appropriately to drive success. During the World Cup tournament Gareth Southgate was careful to keep the focus on the next game. In interviews he would stay in the moment and steer away from discussing predicted match outcomes, while keeping a calm composure. Together with the coaching team he relentlessly assessed the opposition to prepare his young team both mentally and physically for each match. Southgate tackled England’s previous penalty woes head on, no doubt encouraged by his own personal experience in Euro 1996 when he missed a vital penalty kick. He reviewed past failures, and apparently contrary to previous England managers was diligent in coaching the team in this pivotal area. Under his guidance, the players were advised to slow down and have faith as they simulated the lonely walk from the halfway line before taking a spot kick. Sales and salespeople are changing. However, most businesses still expect their sales reps to hit their number on their own accord. Simply allocating a rep a target and then beating them down when they don’t reach it has never really worked. Leaders of successful teams have become adept at sales coaching, helping their team meet targets by supporting them at every turn of the sales process. Every single sales rep can benefit from some form of coaching. Whether it’s finessing their phone manners or suggesting an alternative route to getting face-to-face with that C-level. When Gareth Southgate announced a young and relatively untested squad for Russia 2018, it was met with surprise from some pundits at the time. As a result, the team went into the competition with low expectations, and they far outperformed on the pitch. Through his close association with the Under 21 squad Southgate had developed a rapport and respect amongst the players which helped him to foster a team spirit for Russia 2018. His regular one-to-one discussions with the players provided an informal review of training and performance and gave him the chance to positively reinforce and realign them to the team plan. He encouraged them to focus on the process and not the outcome, instilling a collective ownership of this process. With this careful coaching Southgate prepared the England team both mentally and physically to take on the challenges and perform with pride for their country. Sales leaders require the ability to communicate, innovate, inspire and set the tone for the sales team, helping them to understand the vision of the organisation and paving the way towards their team member’s personal success. A strong sales manager leads by example, listens to their team’s woes and feedback and continually rewards their hard work with positive recognition and interesting sales incentives. Gareth Southgate has observed other leaders in sport to develop his own unique style, both managerial and sartorial. He displays an openness to discuss setbacks and past failures in order to learn and move forward as a team. His personal experience of missing the penalty in Euro ’96 helped shape his coaching approach to prepare his team better. In that tournament he displayed a courage and belief by stepping up to take the penalty while other team mates stood by. 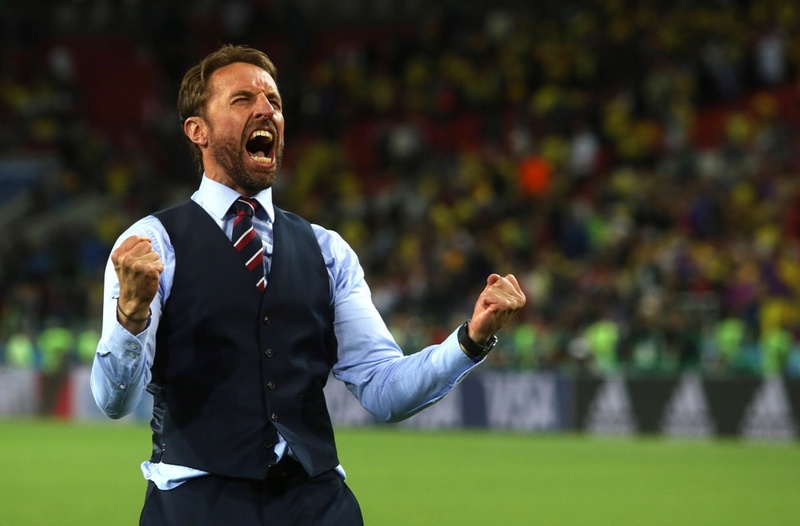 His determination to drill his World Cup team in penalties gave them the confidence to succeed where previous England teams had fallen short. Southgate led England to their first World Cup semi-final since 1990, a feat he admitted was "beyond what we thought was possible". In interviews during the tournament he maintained a humility in triumph and dignity in defeat and always displayed respect and gratitude towards his whole team, including support staff. His praise for his players is evident and it’s clear that it is reciprocated. They worked well as a team and enjoyed wearing the England shirt. In Russia Southgate encouraged them to “write their own stories”, but his strong coaching and leadership style has helped them to find the right words. Southgate knows that the experience of the team in Russia will help build belief and momentum for the future. They have two years to prepare for the European Championship but will start their campaign with the country behind them. Keep the thrill of the contest alive in your own team. Here are 11 sales competitions that will motivate your team to become more productive and profitable. We launched People Insight & Coach at an exclusive customer event in Chelsea Football Club. Discover the 5 key learnings that came from the day here.